Vintage Childhood :: The Muppet Show Tonight! It’s time to meet the Muppets on The Muppet Show tonight. I know you know the rest of the song. 1976 might be known as the bicentennial year in US, but I will always think of it as the year the Muppet Show debuted. I would patiently wait through my father’s mandatory viewing of the CBS Evening News for The Muppet Show. From the first viewing, I knew this was something different. This was the sophisticated older cousin to the innocence of Sesame Street. This was the Big Time. This was what we call the MUPPET SHOW!!!!! Has any show been as beloved by the Muppet Show? And every one had their favorite muppet, right? Like Gonzo? Man, I loved him. I’m still not sure exactly what he was, but he was a legend with the ladies. Lady chickens, that is. You just had to love Fozzy, right? Kermits best bud and although his jokes were at times a touch, er. old, his deliver and smile made it all worthwhile. Is it wrong to love Fozzy and also love his hardest critics, Statler and Waldorf–those curmudgeons in the balcony that had delighted in nothing more than heckling our hard working comics. I always had a soft spot for Rowlf. Something about being that piano man/bartender vibe about him that was so comforting. And when he and Fozzy teamed up to sing, well, it was something real special. And for those who always fall for the nerd, here is your prototype–the precurser to the gents on Big Bang Theory–Munson B. Honeydew was your man. With his hilariously tongue tied helper, Beeker. And you work that career! I wonder what her booking fee is nowadays? And then there was the really edgy rock band, Electric Mayhem, led by the funtastic spider with the gold tooth, Dr. Teeth and his band of misfits, like the wonderous Animal that probably inspired many a drummer who is on the charts today, as well as Zoot, St. Floyd Pepper and Janice, everyone’s favorite straight haired hippy member of the band. And they backed up some amazing guest stars! Oh, what wonderful chaos. And all of it managed with utter charm and love by Kermit the Frog. He was the hardest working frog in show business. And with such grace–with a freak out ever so often. Kermit just radiated the sweetness of Jim Henson. Thanks for the amazing childhood memories, Mr. Henson. Oh Muppets, you’ve been through it all. Movies to fashion. Lunchboxes to live music. You will always be loved. And Muppet Show is available via Netflix for an easy afternoon of watching. And feel free to dance to the songs with your kids. Because I know I did! Talk to them about their favorite characters and who the special guest star is. Remember kiddos have fun when you have fun. That is half the battle! What is your favorite Muppet character? What was your favorite sketch? Have a muppetsational Monday, ya’ll! PS: Most of the photos are from MuppetWikia. Warning: if you visit that link, I cannot be held responsible for the three hours of lost time you’ll spend on the site. PPS: This post is dedicated to Muppetgirl. Tagged with Kermit the Frog, Miss Piggy, Muppets, The Muppet Show. Awwww I love kermie!! (Grover is a special Muppet fave too….although I guess he’s more of a Sesame Street fellow). How hot does Rita Moreno look, by the way?? And i love you busted out with the Mummenschantz!! Sigh. I was always more of a Sesame Street gal than Muppet Show, but I love my Muppets in any form. My true love will always be Kermie (literally; have you met my husband? ), but Scooter also owned a tiny piece of my heart. Oh, and if anyone knows of a cover version of “Can You Picture That?” please let me know. Rocket needs to do some downloading of that business. 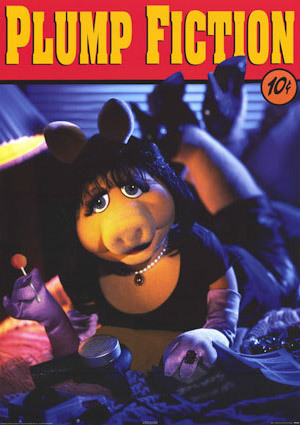 i had a pigs in space poster that was hung over the head of my bed with that awful blue putty. it would periodically fall off the wall and on to me in the middle of the night and scare the bejeezus out of me. Alix! I had to include Mummenshanz! I don’t know if I’m scarred or delighted by the one where they did stuff with clay faces or had masks that incorporated toilet paper. Seriously! I got the soundtrack from the library and almost cried at some of the songs, they bring back memories!! I love Rowlf. What would the world be like without the wonderful things Jim Henson brought us? I always loved the guitarist from Dr. Teeth and The Electric Mayhem. He reminded me of my dad, who was a bassist. We’ve actually been going through the years on netflix. The humor is PERFECT for my six year old and for Friday Night Movie nights. Tammy–I now must find a photo of Lydia the Tattooed Lady! I totally remember her! And Tracy–what a genius idea to rent them through Netflix. I can’t wait to do that with the Peach in a few years! Darling Amber Liddle, I hear you on the sniffles over the songs. As I was writing this I was thinking of all of the songs and how throughout my teen years, I would hear a song on the radio and think… “Didn’t the Muppets cover that?” Such good memories! I’m a fan!!! and I started playing muppets take manhattan (bought the dvd) for my daughter. love those muppets!!! i love love love the muppets!! some of my earliest memories are watching the Muppet Show and the Muppet Movies with my sisters. my dad was also a big fan. :o) i don’t think i could pick a favorite muppet, i love them all! and now my 4 year old loves them too. we have the movies all on DVD and she sings a tear jerking rendition of “Saying Goodbye” (from Muppets Take Manhattan!) i have visited MuppetWiki and it’s one of those websites i have grounded myself from because i would surely neglect my children and hubby if i got too entangled in it’s fabulousness! *side note* i have the glasses from McDonald’s from the Great Muppet Caper…does anyone remember when fast food places did those give aways?? awesome!! YEs! I have been in a mock Twitter Battle with my friend Paola (she hates Kermit and loves Piggy….I adore Ze Frog and said Piggy bugged me….). But then I said “The upside of our disagreement is that when we stumble upon vintage Muppet Movie glasses from McDonalds, we won’t fight over who gets which glass! We had Piggy riding the motorcycle through the stained glass window….ring any bells??? OMG! I have to do next week’s Vintage Childhood post on fast food restaurant giveaways! Thanks for the inspiration ladies! an update on Muppets glasses…went to my fav thrift store today and finally found the missing glass! Kermie on the bike! YAY! sorry…that totally made my day and i had to share!